I don't know why, but I've had a love affair with lamb (cooked lamb only) for years. If it is on the menu, I'm ordering it. If there is a reason to cook it, I'm on it. Even if there isn't a reason to cook lamb, I'm on it. So when I was perusing the meat case at my local super market and saw some loin lamb chops staring back at me, how could I say no? Lamb chops may be a fancy food to eat, but they are very simple to cook, especially on the grill. 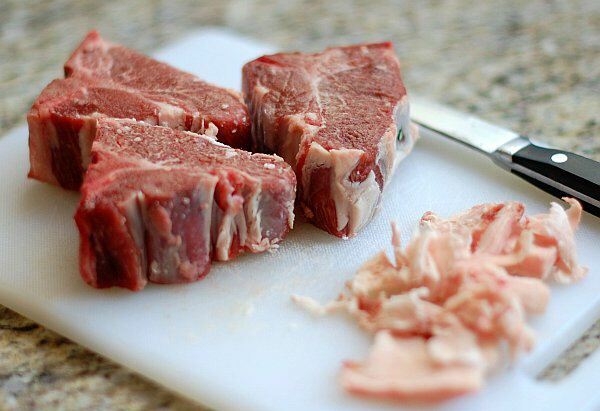 Loin chops are the most tender and leanest of the variety of available lamb chops. Of course that makes them the most expensive too, but worth the extra outlay of hard earned cash. They can be easily identified by the T-bone. 1Trim the fat. Since we are grilling these lamb chops, it is best to trim the excess fat from the edges of the chop to reduce the flareups. This fat won't add flavor in the cooking process (it's the marbled fat throughout the meat that adds flavor), and will only lead to oily flare ups. 3Clean and season. Rinse and pat dry the chops. Brush both sides of the chops with the olive oil. Sprinkle with the dried rosemary, salt and pepper. So far, pretty easy! Leave the meat out of the refrigerator to come up to room temperature for about 1/2 hour. 4 Grill prep. Next prepare your grill. We'll be cooking with an open lid on direct high heat. If using a gas let the grill heat up with the lid closed for 10 to 15 minutes before grilling. This will allow the grates to get hot which will make nice grill marks and add to the radiant heat. If you are using charcoal, start your coals in a chimney and then spread out the coals to create the three zones: no coals; 1 layer of coals; and 2 layers of coals. 5Once the grill is ready and the chops have been out of the fridge for 1/2 hour, carefully oil the grates with a paper towel dabbed in vegetable oil (peanut works great). 6 Grill the chops. Add the lamb chops to the grill and grill over high heat with the lid open. If you get any flareups, move the chop to a cooler part of the grill until the flames die down. After about 4 minutes, turn the chops over and cook for another 4 to 5 minutes. As always, this varies based on the temperature outside, the temp and thickness of the meat, and the grill temp. If you use a instant read thermometer, 155° F is medium. 7Let it rest. Remove the meat from the grill, cover and let it rest for 5 minutes. 8Eat and enjoy! In this case I served it with roasted garlic and smoked tomato couscous and grilled asparagus. Don't forget the mint sauce. If you like this, you should try the leg of lamb. Simple and perfect way to enjoy your chops! Try mint sauce after they have been cooked using a small knife and lightly cover, this is the British and New Zealand favorite way, it’s an amazing taste. I arinate them overnight with ground coriander,cumin seeds, olive oil, turmeric powder, minced garlic and minced ginger. I make a fine paste with the above ingredients. Coat the meat well and leave in the refrigerator overnight to marinate. The grilling instructions provided above at 4 minutes per side do great unless you want to cook them well done. Recipe was from Gordon Ramsay. I’m going to forgo the rosemary and use mint, of course my mint plants are available for early harvest, my rosemary is still too young! For a side I’ll make my sauteed peas (sauteed with garlic/onion and finished with mint too!) and I’ll throw some whole potatoes on the grill for the wee one whom shuns green things. Worked out great. Thanks for the tips! One correction: reverse steps 4 and 5. It’s way easier and safer to oil the grill *before* you heat it. Just perfect! Very important to let them rest. I served mine with corn on the cob and baby potatoes roasted for 30 minutes. Great recipe. I tried it and really loved it. Great instruction. I preferred 4 minutes per side. Have never grilled lamb chops will be my first time and I know they will come out great just following this recipe is the same thing butcher told me to do. My mouth is watering. Great job guy’s, thanks. Rick Kennedy. I like the loin chops marinated in Italian Salad Dressing , . My timing is 15 min /side for medium and 20 min/side for well ~~as my wife likes it . This will be my first time on a charcoal grill ~~I used to do them on a gas grill with the top closed ~~Wish me luck ! As the others above it was WOW!!!! AMAZING! Quick, easy and delicious!! Great recipe & tips. Thank you.